Christmastime in Mexico means all variety of things “Navideño,” from cinnamon-apple scented floor cleaner (a personal fave) to the cranberry-turkey panini navideño at Starbucks, and even a queso navideño (manchego with pecans – I was intrigued and had to buy it, though I’ve yet to bust open the package… thinking it would make a great queso fundido at a holiday party). Prepping for Thanksgiving, I pulled a bag of cranberries out of the freezer to make cranberry sauce, but never got around to it as I came down with a sore throat and ended up spending the day in bed resting. 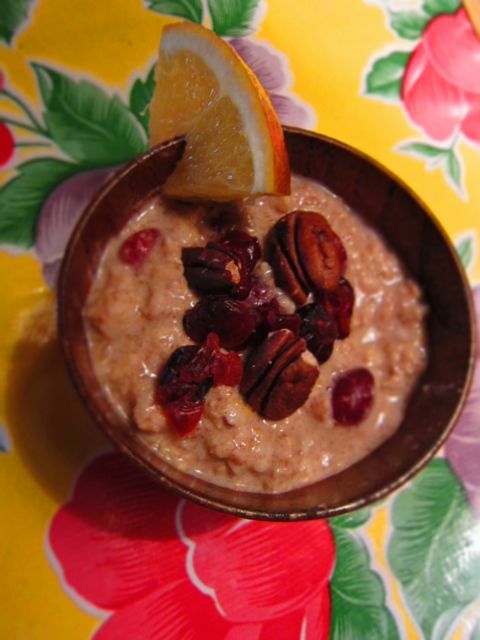 So Saturday morning, feeling recovered and holiday-inspired, I made a batch of avena navideña – cranberry-orange oatmeal – which tasted like a hot delicious bowl of Christmas morning. We’ve been eating a lot of oatmeal lately and experimenting with flavors (piña colada being another recent fave). Even Gabbi, who has not liked oatmeal since I’ve known him, has become a convert. This entry was posted on November 27, 2011 at 10:48 AM and is filed under ¡que comida!, holidays. You can follow any responses to this entry through the RSS 2.0 feed. You can leave a response, or trackback from your own site.